Protesters on Mauna Kea welcomed a weeklong moratorium on construction of the world's largest telescope Tuesday but said they aren't letting their guard down and will continue to keep vigil at the 9,200-foot level. Star-Advertiser. Construction of the Thirty Meter Telescope atop Mauna Kea is on hold for at least a week as protests over the $1.4 billion project continue to mount. Hawaii Gov. David Ige told reporters Tuesday that there will be a “timeout” to facilitate a dialogue. Civil Beat. Gov. David Ige announced Tuesday that the nonprofit corporation behind the Thirty Meter Telescope atop Mauna Kea agreed to his request for a weeklong halt of construction. The stand down came five days after law enforcement officials arrested 31 people who participated in an ongoing protest of the $1.4 billion project. Tribune Herald. Hawai‘i Governor David Ige has announced a week-long "time out" for construction of the Thirty Meter Telescope on Mauna Kea. In a press conference Tuesday afternoon, Governor Ige says he came to this decision after speaking with major stakeholders in the project. Hawaii Public Radio. Governor David Ige announced at a press conference Tuesday that construction of the Thirty Meter Telescope atop Mauna Kea will ‘pause' for a week. He's hoping the next seven days will ease tensions and increase dialogue between stakeholders over the construction of the thirty meter telescope. Hawaii News Now. Gov. 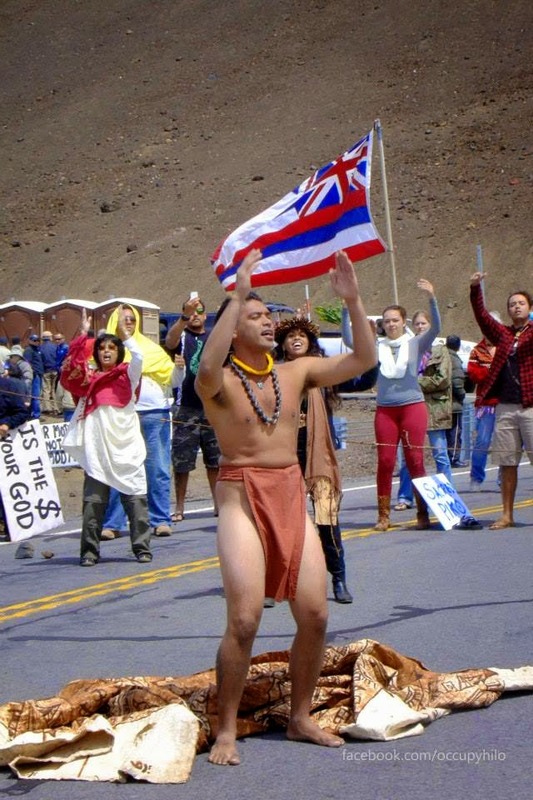 David Ige announced Tuesday that construction of the Thirty Meter Telescope atop one of the most sacred sites for native Hawaiians would come to a halt, at least temporarily. Ige characterized the one-week pause in construction as a “timeout.” KITV4. In a seemingly abrupt about-face after the first major controversy of his administration, Gov. David Ige nominated longtime conservationist Suzanne Case on Tuesday as the new chairwoman of the state Board of Land and Natural Resources — a selection that quickly won praise from members of the state's environmental community. Star-Advertiser. Hawaii Gov. David Ige has appointed Suzanne Case to head the state Department of Land and Natural Resources, ending weeks of speculation. The governor withdrew his previous nominee, Carleton Ching, three weeks ago amid mounting public opposition over his ties to developers and lack of experience for a job that requires leading a department comprised of 10 divisions and nearly 900 employees. Civil Beat. Gov. David Ige on Tuesday nominated Suzanne Case, the longtime head of The Nature Conservancy in Hawaii, to lead the state Department of Land and Natural Resources after withdrawing his first nomination, Castle & Cooke Hawaii executive Carleton Ching, due to backlash from environmental groups. Pacific Business News. Today Governor David Ige announced his new nomination to lead the Department of Land and Natural Resources (subject to confirmation by the Senate), Suzanne Case, and the widespread opposition to Ige’s previous choice, developer-lobbyist Carleton Ching, is calling the choice a win for Hawaii. Hawaii Independent. Governor David Ige on Tuesday announced his nomination to lead the Department of Land and Natural Resources and his choices for the Board of Education. The appointments are subject to confirmation by the Senate. Hawaii News Now. Gov. David Ige announced Tuesday his nomination to lead the Department of Land and Natural Resources and his choices for the Board of Education. KITV4. Gov. David Ige on Tuesday appointed a banking executive and two former public-school educators to the state Board of Education. Ige named Lance Mizumoto, president and chief banking officer of Central Pacific Bank, to the board along with longtime Kauai educator Margaret Cox and former teacher Hubert Minn. Star-Advertiser. Spending by special interest groups lobbying lawmakers during the first part of the current legislative session is running well below last year’s pace, according to reports filed last week with the Hawaii State Ethics Commission. The more than 200 interest groups with registered lobbyists reported spending a total of $832,808 during the period from Jan. 1 to Feb. 28. Civil Beat. Student lunch prices will to go up by 25 cents in the fall to $2.75 for high-schoolers and to $2.50 for elementary and intermediate students, the first price increases since 2011. Breakfast prices will go up by 10 cents to $1.10 and $1.20 for elementary and secondary students, respectively. Department of Education officials cited increases in food and labor costs, which have pushed up meal expenses by more than 17 percent in the last five years. The move is expected to raise an additional $1.7 million a year for the food services branch. Star-Advertiser. A state House bill attempting to create a regulated medical marijuana dispensary system throughout Hawaii will be reviewed by its final committees today. House Bill 321 establishes a system of medical marijuana dispensaries in the state and puts limits on the amount that can be purchased. The legislation also prohibits counties from enacting zoning regulations that prevent the use of land for licensed dispensaries. West Hawaii Today. More than 4,000 charge cards under the pCard program are in the hands of government workers, ranging from secretaries to department heads and politicians. But the oversight of the pCards is left largely to individual agencies — something that the state auditor raised questions about when examining the program in 2010. Star-Advertiser. Aiming to reduce the 55 million gallons of raw sewage that enters the ground daily — and makes its way into Hawaii’s drinking water — state lawmakers are pressing forward with a bill that would ease the financial pain of converting to modern waste disposal systems. West Hawaii Today. Hawaii legislators’ efforts to address the state’s affordable housing crisis may barely make a dent in the huge demand for homes. Civil Beat. In June, former Governor Linda Lingle begins her new job as COO for Illinois. As for Hawaii politics, Lingle believes the Republican Party will eventually cut into Democratic dominance, the way it did when she was GOP chair and then governor. Hawaii News Now. A new report says foreign students studying in Hawaii are contributing hundreds of millions to the state's economy. The report released Tuesday by the state Department of Business, Economic Development and Tourism says foreign students made a direct economic impact of more than $205 million during the current school year. Associated Press. The Senate Ways and Means Committee on Tuesday voted to extend a 0.5 percent General Excise Tax surcharge for Honolulu’s rail project another five years beyond its Dec. 31, 2022 expiration. The vote on House Bill 134 indicates that lawmakers are supportive of helping the city complete it’s $6 billion driverless commuter rail project despite cost overruns and questions of lax oversight. Civil Beat. Deputy Prosecutor Jon Riki Karamatsu announced his resignation on Tuesday following his second DUI arrest over the weekend. Hawaii News Now. Honolulu Prosecuting Attorney Keith Kaneshiro has accepted the resignation of Deputy Prosecutor Jon Riki Karamatsu. Civil Beat. Hawaii Volcanoes National Park on Tuesday announced upcoming flight plans for the remainder of April through May 7. West Hawaii Today. Mayor Alan Arakawa wants to explore the possibilities of making Maui Electric Co. a public utility, one that could even compete against Florida-based Next-Era Energy Inc., which is seeking Hawaii Public Utilities Commission approval to acquire MECO's parent company, Hawaiian Electric Industries. Maui News. Hawaiian Electric and NextEra held the first in a series of public meetings. Two meetings were held on Maui on Tuesday. Senior leaders and other employees from both NextEra and Hawaiian Electric were on hand to talk about how they plan to increase renewable energy and lower customer bills. NextEra says it wants input from the community. KHON2. NextEra Energy Inc. and Hawaiian Electric Industries will host a series of open house meetings statewide to acquaint the public with NextEra and share details on the upcoming merger between the two energy companies. Maui Now. The Makawao Fourth of July Parade plans to carry on, unchanged, with its longtime parade organizer vowing Tuesday night to "dig my heels in" against the state Department of Defense. Maui News. A contractor has been hired to remove a sailboat that ran aground in a secluded area on a reef at Moloaa Bay April 1. Garden Island. The state Department of Land and Natural Resources has hired a contractor to remove a 55-foot sailboat that ran aground off Kauai earlier this month. The department says it's expected to cost $185,000 to remove the Kikimo from the reef at Moloaa Bay. Associated Press. Just how famous are Kauai’s chickens? Enough for the New York Times to write a lengthy report about them. Garden Island. Maui County Council members took a first step Tuesday toward providing a government subsidy to keep the Molokai ferry afloat, but it remains to be seen whether it will be too little too late. Maui News.